If you can believe it, the Marxist propaganda in this book has been indoctrinating our children’s minds since 2000 (Wait, that’s the same year Barack Obama first ran for national office. Hmmm.). Its socialist agenda is writ large on every page and the author, Comrade Cronin, makes no attempt to hide her cherubic and cuddly communist manifesto. The story starts with a problem and quickly snowballs into an allegory for a socialist takeover of our society. The main character, Farmer Brown, who stands for freedom (a.k.a. capitalism), has some trouble on his hands. His cows have turned traitor. The cows managed to find a typewriter (writing is a common tool of the proletariat), which Farmer Brown at first thought was simply remarkable. It wasn’t long, however, until Brown realized what he was dealing with. The cows’ first message was a demand – “We want some electric blankets,” their Leninist letter read. 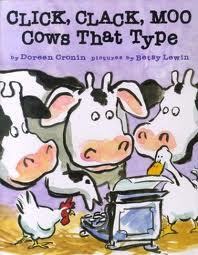 After Farmer Brown declines the cows’ demands, the situation rapidly unfolds. The cows go on strike and Farmer Brown is left without milk. In other words, the lazy, commie pinkos give up their duty to society. Surprise, surprise. When Farmer Brown is slow to respond, their egos become embiggened and they start to recruit. Soon the hens join the cows’ communist cause. You want to know what really gets my gander up? These animals were born with a covering of hair to protect them from the cold, but that’s not good enough for them, is it? No, they’re not happy with the life God has chosen for them and so have to make their master’s life harder. Typical. The story then becomes a rallying cry for the “downtrodden” farm animals. Farmer Brown makes a weak attempt to quell the uprising by writing a letter to the cows and hens (and therefore adding credence to their use of writing as a means of negotiating) and he falls right into their trap. The cows respond that they will give up their typewriter for electric blankets. But after Duck, the supposed neutral party in the ordeal, delivers the blankets, he returns not with the typewriter, but with another letter – this time from the rest of the ducks requesting a diving board for their pond! It just shows the pervasiveness of the socialist seed. It’s an epidemic that must be stomped out, like an insect under the work boot of American Freedom. As soon as Farmer Brown got that first note, he should have realized what needed to be done. Right then and there he should have gone from being a milk farmer to a beef farmer. Picture courtesy of Betsy Levin.